Do you wish to be clutter free? You are here: Home / Do you wish to be clutter free? Feeling overwhelmed with too much stuff which is costing you time and money and added stress? Together we will help you make those changes to your home and lifestyle to achieve your goal! We will leave you feeling uplifted and re-energised. We will be sensitive to your needs and hold your hand from start to finish. We will work at a pace that is comfortable to you. We will help you love your home. We will not discard any item, paper or object unless your permission is given. We identify what space you have and then advise the best way to utilise and store items. We will supply storage boxes and baskets etc to keep everything tidy and in its own place and get rid of all unwanted items. We will help to create more space; put energy back into your home; and give advice on decorating, changing the layout, colour popping, and using accessories to transform your desired look. If you are selling your home, first impressions really count. We will boost your market value, to enhance your chances of getting a quick sale and completed chain. We recycle all unwanted items or give them to local charities. Whatever the place or space – we can help!! You can trust us – we are a complete, discrete and confidential service. Just ring Allyson – 07763876049 or Zoe – 07525439692 for a free estimate. Alternatively, feel free to email or write to us for an estimate or further information. 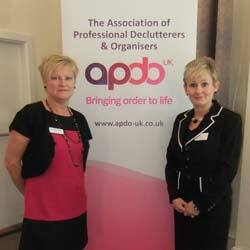 Declutter Divas are members of The Association of Professional Declutterers & Organisers UK. Looking at mess can trigger a migraine. Apparently, viewing clutter overstimulates the nerve cells of the brain, triggering an attack.